It is like a splash of light appearing amid the dark woods that surround it. It stands there, on the slopes of the Bessillon mountain, in a place that is twice blessed. Firstly, it is in Provence, where Christianity was first brought to France, and where the first monastic foundations were established in the fourth century. 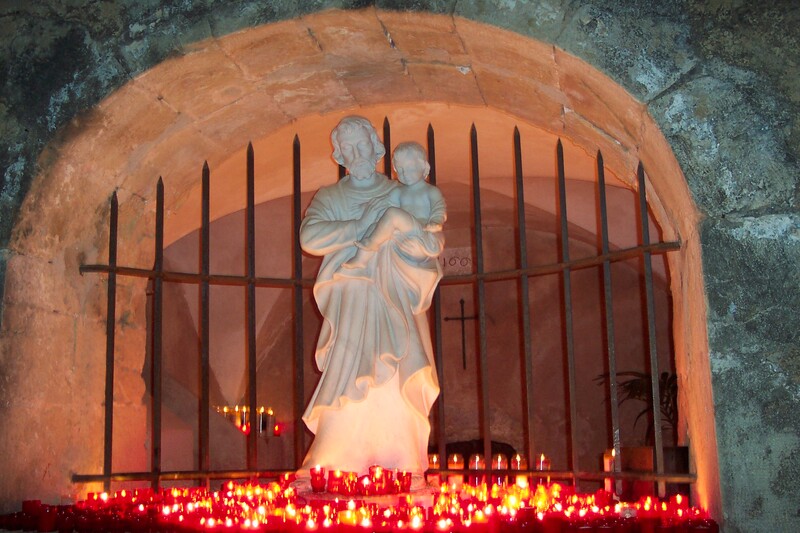 Secondly, it is at Cotignac, a place of prayer, a chosen land, visited by the two greatest saints in the history of Christendom, the Virgin Mary and Saint Joseph, the adoptive father of Jesus Christ. In 1519, on Mount Verdaille, the Virgin Mary appeared to a woodcutter, Jean de la Baume, and then on the 7th of June 1660, on Mount Bessillon, her husband Saint Joseph appeared to a thirsty shepherd, causing a spring to flow from the rock for him. The spring still flows there and is a symbol of the special blessings of this place. This is a picturesque village, with its ‘Rock’, a sheer cliff 80 metres high and 400 metres in length, which shelters the village and constitutes its great attraction. That lover of his home village, Monsieur Gabriel Henri Blanc, said in the introduction to his book The Religious History of Cotignac(1985): There is very little historical information about Cotignac. In fact our village has remained invisible in the history of Provence and of France… Until the nineteenth century the valley was entirely cut off by the Rock, and no major routes passed through Cotignac. But, in the mystery of His divine plan, as the author says, Providence had written Cotignac into the pages of the seventeenth-century –France’s ‘Grand Century’. On the 10th of August, the feast of St Lawrence, in the year 1519, the Holy Virgin, accompanied by Saint Michael the Archangel and Saint Bernard, appeared in the fields to a man of great piety called Jean de la Baume, and ordered him to tell the clergy and parish of Cotignac that they should go in procession to Mount Verdaille and build a church there, dedicated to Our Lady of Grace, and then she would grant a number of blessings and favours to those who called upon her in that place. She appeared again on the 11th August. On the 14th of September, Holy Cross Day, the parish proceeded to lay the first stone of the chapel. From then on the number of pilgrims grew and among the numerous miracles granted by the Mother of God must be counted the birth of Louis XIV, called ‘the Godgiven’ for that reason. For in 1637, after 22 years of marriage, the royal couple, Louis XIII and Anne of Austria, still had no heir. This was a critical situation for a hereditary monarchy. Then, in the night of the 3rd of November 1639, the Virgin Mary appeared three times to an Augustinian monk of Montmartre, Brother Fiacre. In her arms she held a child, whom she said was the Crown Prince. She showed the monk the interior of the church of Notre Dame des Grâces at Cotignac and the picture on the high altar which portrayed her, and told him that France would have an heir to the throne if the Queen would arrange for three novenas of prayer to be said, one at Cotignac in the church of Notre Dame de Grace, and two in Paris, one at the cathedral of Notre Dame and one at the church of Notre Dame des Victoires in Paris. As he could not go straightaway to Provence, Brother Fiacre said the three novenas in Paris, the last finishing on the 5th of December 1637. Exactly nine months after this the heir to the throne was born. When, in February 1638, Brother Fiacre and his Father Superior were sent by Louis XIII to complete the novena at Cotignac, as had been required, one thing demonstrated the authenticity of the appearance of the Virgin. The picture the Virgin Mary had shown to Brother Fiacre was not on the high altar. Brother Fiacre expressed his surprise and was told: The picture you are looking for was taken down to the sacristy a short while ago, to be displayed there. The miraculous picture still exists at Notre Dame des Grâces. Through the intercession of the Mother of His Son, God had shown his special love for France in giving her a Crown Prince. This was confirmed on the 7th of June 1660, by the appearance of Saint Joseph, husband of Mary and adoptive father of Jesus. The 7th of June -what a significant date! At Cotignac, on the 20th of February 1660, Louis XIV had come to thank Our Lady for the gift of life. Continuing his royal progress, he arrived at the beginning of June at Saint Jean de Luz to receive his bride, and it was on that very day that Saint Joseph appeared on the Bessillon. To quote the seventeenth-century historian Honoré Bouche: We can say that on that day, the 7th of June, when the queen, then Marie-Thérèse of Spain, said goodbye to her father the King of Spain and left the Ile de la Conférence to enter France, on that very day, in the parish of Cotignac in Provence, half a league distant from the chapel of Notre Dame de Graces, youth of humble birth named Gaspard found the famous St Joseph’s Spring.’ This youth , a native and inhabitant of Cotignac, said that he was at his work out on the hillside , and had a great thirst, and was longing for water, when a kind old man appeared and showed him the place where he would find water if he lifted the rock. When Gaspard had found the water, the old man, who said he went by the name of Joseph, disappeared. On the 9th of August the people of Cotignac started to build a chapel at the place when the old man had appeared. From every corner of the province, and from beyond its borders people come to the spring, the sick and infirm, with every kind of disease, and most go away healed or reconciled to their infirmity. In February 1638, Louis XIII made his famous vow, dedicating his person, his throne and France to the Virgin Mary. From the 19th of March 1661, the feast of Saint Joseph became a holiday throughout the kingdom, by the royal decree of Louis XIV (Cf. Bishop Bossuet’s famous eulogy). Cotignac has yet another privilege: that of having been the first home in France of the Oratorian order, founded in Rome in the 16th century by Phillip Neri. The first group of French Oratorians was created to provide for the needs of pilgrims to Notre Dame des Grâces, and later became part of the Oratory founded by Cardinal de Berulle in 1613. When the chapel of Saint Joseph of the Bessillon was inaugurated, it was to the Oratorian Fathers that its care was entrusted by the bishop of Fréjus. They built a monastic house close to the spring. There they led a life of prayer and deep seclusion, and were called the recluses. However, they welcomed pilgrims, taught them Catholic doctrine and offered hospitality to those who desired to spend a few days, far from the noise of the world, to be close to God and to benefit from their advice. The truth of the words of the bishop of Fréjus on 31st January 1661 is borne out today, at Cotignac: God, through the blessings that he wished to grant in honour of Saint Joseph, sought to make indivisible in the devotion of the faithful, the two holy persons (Mary and Joseph) whom he had joined together on earth, for the mystery of our salvation. For several years, Christian couples and families have been coming in increasing numbers to open their hearts to this exemplary couple: the parents of Jesus of Nazareth. The sites of Notre-Dame des Grâces and the Font Saint Joseph du Bessillon have reverted to their original purpose. Taking over from the Oblates of Mary Immaculate, the Fathers of the Community of Saint John provide for the needs of the big pilgrimages at Notre Dame des Grâces, while the Sanctuary of Saint Joseph, although once again visited by pilgrims, has re-assumed its original character as a place of retreat and solitude since the Benedictine nuns were established there in 1975. At the time of the Revolution, the Oratorians had to leave, and the buildings, then left unoccupied, fell into ruins. The chapel, which alone remained standing, was open only for the 19th March pilgrimage. It is the life experienced by the Benedictine Community which has made it what it is: this is how each monastic family, living faithfully in accordance with the rule of Saint Benedict, acquires its own particular tradition within the great Tradition of the Church. The Monastery of La Font Saint-Joseph du Bessillon was born in 1947 in the land of Islam, at Medea in Algeria, in order to carry the message of the Gospel there purely through contemplation and prayer. It was then the Convent of St Benedict, of the Belgian congregation of the Queen of the Apostles. On Mount Teniet-el-Hadjar, where it is built, everything is conducive to the worship of God in his greatness: the beauty of the site, the silence in which the calls to prayer ring out in turn, from the bells of the convent and from the muezzin of Medea. But above all there is in the air, as diffuse as the light itself, a sense of the grandeur of God. This feeling of a place in harmony with its purpose inspired its choice as an especially suitable place for the worshippers in spirit and in truth that the Father seeks (John 4, verse 23). Thirty years of prayer and work went by. There was direct contact, and, so to speak, a feeling of family, between the sisters, who had learned Arabic, and the surrounding population, thanks largely to a sewing workshop which was freely accessible to any of the girls, teenagers and young women who came looking for work. These contacts led to other more personal ones when visitors came to the convent parlour. After Algeria became independent, political developments in the country made it impossible for the Community to fully pursue its religious life. During this same period the convent had separated from the Belgian Congregation, and become independent by decree of the Sacred Congregation of Religious Institutions. And so, in 1974, the Community decided to take up residence in France. 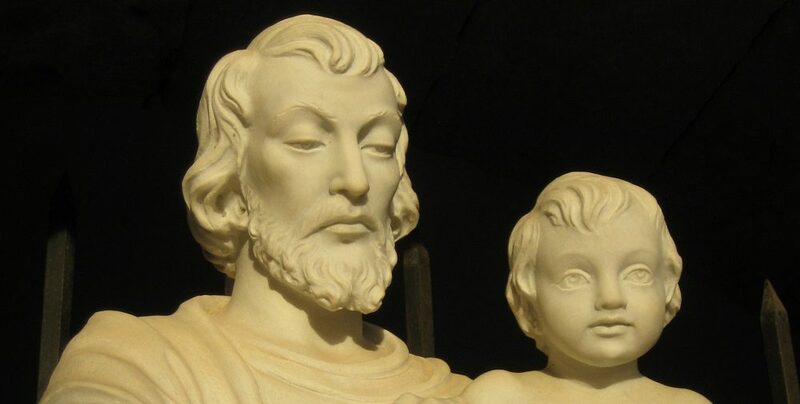 Seeing a spiritual affinity between Saint Joseph and Saint Benedict, the one, Head of the Holy Family, the other, Father of the monastic family, and both humbly silent in the divine Presence, the Benedictine nuns strongly favoured the site of the Font Saint Joseph at Cotignac. An adventure began in which they placed their trust in Divine Providence. In just a few years of joyful work, with Saint Joseph inspiring the generosity of faithful friends, the sisters have been able to build a convent. The architect Fernand Pouillon, in the last years of his life, drew and donated the plans and supervised the building work. And although it may not yet be completed, they now have everything needful for the harmonious practice of Benedictine life.